After the last Peace Dollar was struck in 1935, it would be close to 40 years before the next one dollar coin would be issued by the United States Mint. Then, in 1971, the Eisenhower dollar was struck and issued between November 1st 1971 and 1978. Frank Gasparro, the Chief Engraver at the US Mint, was the designer of this dollar coin. 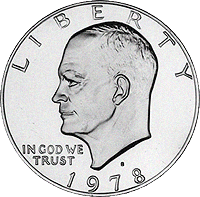 Featured on the obverse sign of the coin is the profile of Dwight D. Eisenhower, who was a General and President that had passed away in 1969. Inscriptions on the obverse read Liberty, the date and In God We Trust. On the reverse side is a bald eagle holding an olive branch in its talons and landing on the moon's surface, inspired by the Apollo 11 mission insignia. The inscriptions read United States of America and One Dollar. At the time, there had been a rise in bullion prices that dated back to 1965, and so instead of silver, coins were being struck using a copper-nickel clad composition. The Eisenhower Dollars for circulation are struck using the copper-nickel base. The outer layer of the coin had 25% nickel and 75% copper. The inner layer contained a core that was pure copper. The final composition of the coin was 8.33% nickel and 91.67% copper. Following a lengthy debate by legislators, some collectible coins were struck using 60% copper and 40% silver for the core, and 80% silver with 20% copper for the outer layer. Today, the Eisenhower Dollar continues to be a popular collectible with bullion aficionados. This is due to the range of compositions and conditional rarities within the entire series, which add to the difficulty of completing a collection. There are some things worth noting regarding this one dollar series. To begin with, there are no Eisenhower Dollars dated 1975. Instead, the coins that were minted in this and the subsequent year bear the dates 1776-1976. For the celebration of the bicentennial of the American Revolution, the reverse design was also changed, and featured the Liberty Bell in front of an image of the moon. This reverse design was done by Dennis R. Williams. The circulation of this coin was limited, with most of the issued coins being used in Las Vegas Casinos. The intrinsic value of the Eisenhower Dollar today is dependent on the value of silver. There are various versions that you can find to add to your collection, including uncirculated variety and proof versions. These are the ones that have 40% silver. Should you want to have a rare Eisenhower Dollar that has premium value in your collection, look for one which is High Grade, without contact marks of imperfections. Bookmark this page (Ctrl+D) and come back later. The price updates every 15 minutes.